Did you ever create something beautiful, and then let it go? 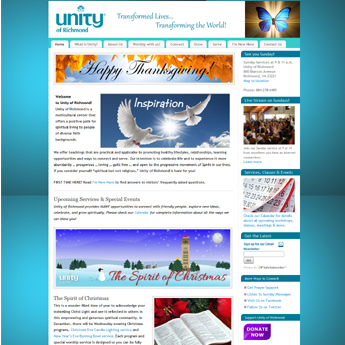 The first websites we designed for churches were simply stunning. Church leaders loved them, and they especially loved meeting Sunday visitors who told them they had been attracted by their beautiful new websites. Those sites popped with arresting images and brilliant color. But they were more than just pretty; they also were very user-friendly and fast-loading, two things loved by search engines as well as humans searching for a new church home. 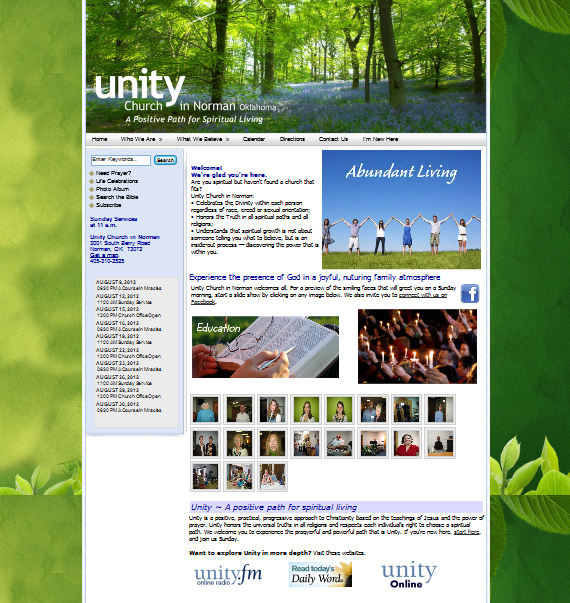 Here are just two examples of home pages created with our original website builder. Change was hard, when it came. When Google, god of the internet, decided that all websites needed to display well on mobile phones, we already had invested many years of hard work in a website development and hosting solution that (we then discovered) would never meet Google’s requirements. It was time to check out all the alternatives and start over with something entirely new. Six months after beginning our research, we introduced new mobile-friendly designs based on WordPress. The first websites we created with WordPress performed well on all devices and met Google’s requirements for mobile-friendly design, and they still do. 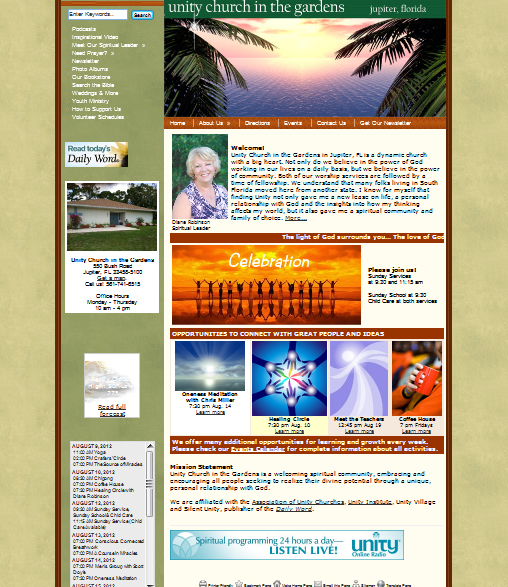 These sites are based on our custom version of the Mantra theme for WordPress. We chose Mantra for many reasons, partly because it allowed us to create completely original designs for churches we served. We also chose it partly because it was a top-rated “responsive” design, meaning it automatically adjusted for the best display on any device. 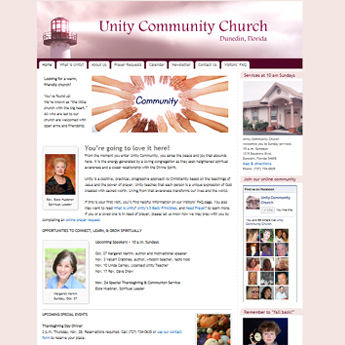 Here are images of designs we created for churches in Lafayette, NJ and Hemet, CA. Visit the live sites by clicking or tapping on the images. And because we could customize the design for any website, we also could use Mantra to create websites for churches with specific brand requirements, and we did — lots of them. 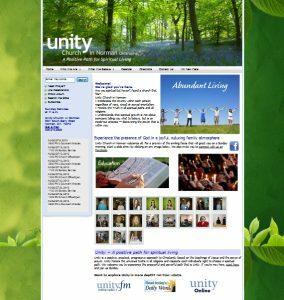 For examples, see unityofnashville.org (beautifully maintained by David Gumina, Unity of Nashville’s office administrator) and unitygreaterportland.org (maintained by Friends of Ministry). But time does not stand still, and neither do standards for the latest and best practices in web design. Those continued to evolve, bringing a completely different look and feel to the most up-to-date websites. Those websites featured briefer main menus, full-screen display, much larger images, larger text, more video and more white space. 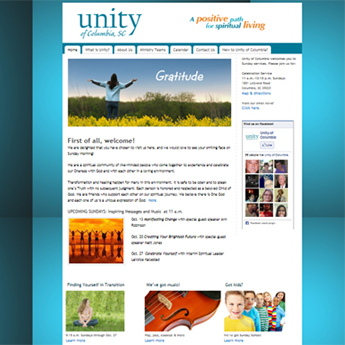 The custom designs we created with these newer standards are based on the WordPress theme Tempera. These websites meet visitors’ demands for big-and-beautiful images and videos, and they look and work even better than Mantra on mobile phones, tablets and desktops. The technical underpinnings are better, too, so Tempera-based websites load faster and earn more “A” grades on parameters that search engines use to decide rankings. 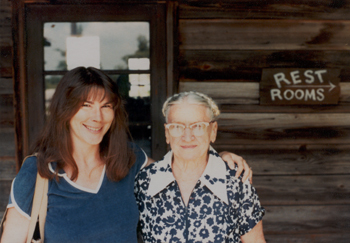 We were so ready to rest after this change but, as my dearly departed, much-loved Grandma loved to say, “No rest for the wicked!” — an expression always delivered with a sweet smile. That’s her with me, in my much younger days. So in 2017 we offered another new design based on the WordPress theme Septera. With even larger images, additional special effects and way more flash, websites built with Septera are out to impress. 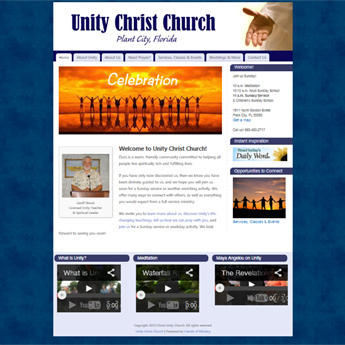 One example is unitydaytonabeach.org. All of the themes we’ve used were developed by Cryout Creations, an Eastern European firm that provides outstanding support as well as beautiful WordPress themes that can be fully customized. What’s next? Subscribe to our Ministry Marketing Advisor to stay informed. The web is evolving. Our designs are evolving. 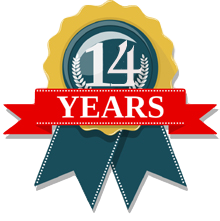 Is it time for your website to evolve? Contact us to explore possibilities.